Our approach is focused on increased system health by improving soil and plant fertility. We encourage life and diversity from the micro-level (microbes and minerals) up to macro-level (people!) creating more sustainable farming practices. Much of our thinking at Ragmans has been developed by Juanfran Lopez (left) who has studied and taught in Europe and South America. These techniques were originally introduced by Jairo Restrepo (right), who continues his relationship with Ragmans, teaching here every summer. Our video - Harvesting the Sun introduces Jairo and his thinking. This article also explains our approach in more detail. Our goal is to measure the effectiveness of these biological techniques on system biology and mineral balance on plant and soil health. In addition to this we are developing a high quality range of preparations and techniques such as biofertilisers, bokashi, aerobic teas, mineral chelations, mychorriza, chromatography, lactic acid bacteria, and native microbe reproduction among others methods…. We wish to offer a service tweaking these techniques into specific land situations with local farmers. This section of our website is a bit complex. We have put some of the tools that we use in the section below. 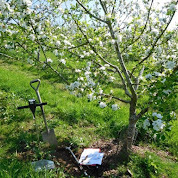 We have also gone into detail with our fertilisation plan for the orchards as it shows how we actually apply these tools. We would welcome comments!